Bush’s Market is a family-owned business with a farm, store, and butcher shop. Our vegetables, grains, and fruits are all grown on our 260-acre farm in Columbus, IN. Fall is a wonderful time to visit us. During this season, the leaves change color to red and gold, and the scent of apples fills the air. The natural beauty of our farm makes shopping for seasonal produce a fun and relaxing activity. We grow and sell 17 different varieties of apples. Celebrate fall by baking an apple pie or making caramel apples with your family. 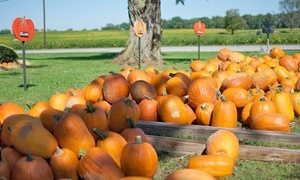 Our pumpkins range from small to large. We also offer white pumpkins, which can be used in recipes or as part of holiday décor. This type of corn boasts multicolored kennels, making it ideal for centerpieces and other seasonal displays. Squash can be used in both sweet and savory recipes. Try baking with it, pureeing it for soup, or adding small chunks to pasta for a healthy burst of flavor. We grow 8 different varieties. We proudly grow gourds on our farm. They’re used in crafts and as an ingredient in many dishes. Chrysanthemums add a splash of color to gardens in the fall. Bouquets of these late-blooming flowers also make thoughtful gifts. The famous Bush’s Market Pumpkin Cannon is fired during the fall. Drop by our farm to see it. We also have colorful displays and many opportunities for you to take photos with your loved ones. Stay up-to-date on seasonal events and activities by giving us a call at 812-379-9077.